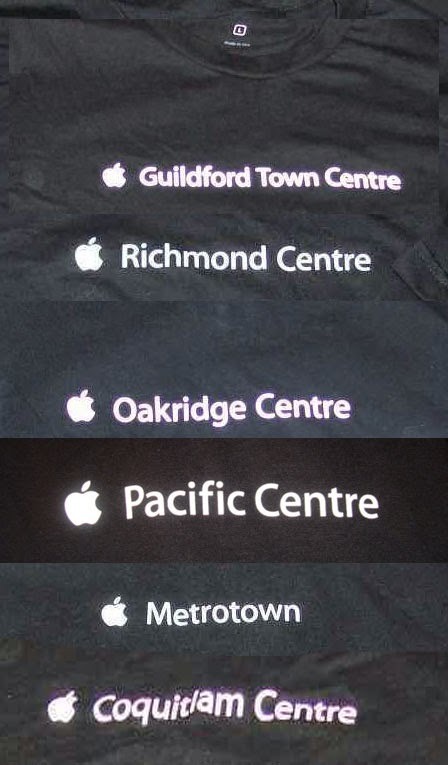 For sale is a hard to find collection of 6 black British Columbia Canada Apple Store opening t-shirts: Oakridge Centre in Vancouver, Richmond Centre in Richmond, Metrotown in Burnaby, Guildford Town Centre in Surrey, Coquitlam Centre in Coquitlam and Pacific Centre in Vancouver. 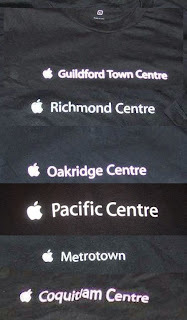 All are XL except Guildford Centre which is Large. You will probably not find all 6 elsewhere as this collection took several years to assemble.